Detail from a hand quilted replica of a quilt made by Susan B. Anthony at the Susan B. Anthony Birthplace Musuem. We left off on the last post with my husband, Bill, and I out in Western Massachusetts having been to a Blondie concert, MassMoCA and the Museum of Dog. I’ve saved the historical sites for this part of the story. As many of you know, I have been involved at some level with the Sabbathday Lake Shaker community for quite a few years. I have volunteered on work days, taught rug hooking, and demonstrated the craft for Open Farm Day and Harvest Festival there. I have unabashedly fallen in love with the place, so aptly known as “Chosen Land” to the Shakers, and with the people there. Along with a truly dedicated staff and team of volunteers, for whom the work is clearly deeply meaningful, there are the living Shakers themselves, Brother Arnold and Sister June. For them, Sabbathday Lake is home, and because of them, it is a sacred place that can not be, and I do not believe will ever be, considered wholly a museum. In spite of my involvement with Sabbathday Lake and my interest in Shaker history, I had never been to any of the Shaker museums that are just a day’s drive or less from home. It was at the Susan B. Anthony Birthplace, in Adams, that the very kind and capable staff recommended a visit to the Hancock Shaker Village, only about thirty minutes from there. But first, let’s talk about the Susan B. Anthony Birthplace Museum. The Susan B. Anthony Birthplace Museum is extremely well done in every possible way. I would highly recommend you click on the link and thoroughly explore their website and then make plans to visit. Upon entering the gift shop, where you must purchase your tickets before going in to the homestead, you will be greeted by knowledgeable and friendly staff members who have a clear enthusiasm for the museum and its history. You will have the choice of having a docent give you a guided tour, using an electronic audio/visual tour device, or simply going through the home in a self guided way, reading the plentiful and detailed exhibit descriptions in every room. My husband chose the A/V tour and I chose to just walk through the museum on my own. This museum is so professionally and engagingly arranged and annotated that I was taking mental notes on how this example might inform decisions for our own historical society back home. Every aspect of Susan B. Anthony’s remarkable life is covered, from her family of origin, to her early life and career as a teacher, to her work in the temperance, abolitionist, and of course, women’s’ suffrage movement. All of this history and context comes very much alive with the extraordinary collection of artifacts, documents, and ephemera belonging to her and/or her life story. I think my favorite artifact in the museum (a photo is in the slide show below) is the plaster cast made of her clasping hands with Elizabeth Cady Stanton. I felt goosebumps as I looked at this incredible object. And, being a fiber/textile geek, I was also very interested in the completely hand-quilted replica of a quilt that Susan had made as a young person. Additionally, there are antique woven coverlets, linens, dresses, and the tools of carding and spinning in the home. It is beyond the scope of this post to tell the entire story, but again, the museum website is extremely thorough, much like the museum, so click on over to that for so much more information, including on the restoration of the home itself. Susan B. Anthony died in 1906, fourteen years before women were finally given the vote in the United States. It is unfortunate that she did not live to see the final fulfillment of that dream, but she left behind millions of grateful women, including those of us who were not yet born. My grandmother was three years old in 1906 and seventeen years old before women had the vote. I have thought about that often, that my own grandmother was born in a time when she might never have expected to vote. It means that we have not had this privilege in America for very long. Let us never fail to exercise it. Susan B. Anthony may have been certain that eventually her work would win the day, even if she wouldn’t live to see it. She is quoted as saying, “Failure is impossible.” The gift shop at her birthplace has silver toned bracelets with these words in them, and I couldn’t leave without one. Here are the photos I took, with permission, which do not begin to do justice to the museum. I have to objectively say that this is an absolutely lovely and beautifully curated museum village of over twenty historic buildings and thousands of Shaker artifacts, not to mention the extensive gardens, extremely knowledgeable and personable docents, and an onsite visitors’ and educational center. It is also a breathtaking venue for weddings and events. I say “objectively” because I have to remove the part of myself that compares it to Sabbathday Lake. This is not a fair comparison and should not be made. Sabbathday Lake is literally the only Shaker location on Earth that is an active Shaker community with a working farm, shops, gardens, and livestock that are not strictly for educational purposes, but are actually the continuing business in support of the living Shakers who have been conducting their spiritual and working lives there since 1783. Sabbathday Lake is the only place on Earth where you can attend an actual Shaker worship service. No Shaker museum in the country should be compared to this, because their missions are different. The other museums are doing critically important work in preserving and honoring the memory of the Shakers who no longer inhabit those locations and educating the public about Shaker life. Having said that (and then I’ll leave this point alone, I promise), that part-of-me-that-was-comparing-and-should-not-have-been felt a profound sadness at Hancock. I left there, after having a truly wonderful visit, more committed than ever to my volunteer work at Sabbathday Lake with a renewed sense of just how precious that community is, how rare, how indescribably valuable, and how humbled I am by my luck to have it right here in my own backyard in Maine. OK, onward. Hancock Shaker Village is a must see on your trip through the Berkshires and Western Massachusetts. It is possible to spend an entire day, maybe more, there going through each building, taking advantage of the tours and demonstrations that are offered, having a bite to eat in a remarkable fresh food cafe on site, and shopping the gift shop (where, incidentally, they sell products still made at Sabbathday Lake, as does the Mount Lebanon historic site which we will talk about in a bit). It was so much fun to do the right kind of comparing when we saw the Hancock dwelling house, the laundry room, the dining area, the meeting house and seeing how they were similar and yet different to these same spaces at Sabbathday Lake. Bill teaches soap making in the laundry room at Sabbathday Lake and was having a great time in its companion space at Hancock. Across the street from the main village there is a path back to the reservoir and also leading to the Shaker cemetery, which characteristically has just a single stone representing all who are buried there. The gate was open to the actual burying ground, but out of reverence we remained outside the gate. It is a beautiful and peaceful place to visit and to remember the bustling Christian community that once existed there. Here are a few pictures of Hancock Shaker Village, including pics of its iconic stone round barn. As before, I took a lot of fiber/textile related photographs. Notice also the beautiful lunch I had in the cafe there. “The Shakers at Mount Lebanon led the largest and most successful utopian communal society in America for 160 years, from 1787 to 1947. From this central community developed the Shakers’ ideals of equality of labor, gender, and race, as well as communal property, freedom, and pacifism. From Mount Lebanon also grew the now famous Shaker aesthetic of simplicity, expressed in their objects, furniture, buildings, and village planning. With over 6,000 acres and 100 buildings, Mount Lebanon Shaker Village was a driving force in the agricultural, industrial, commercial, and institutional activities of its day. The Village was divided into smaller “Family” groups (Church, Second, Center, North, East, South, and so on. ), each with its own leadership, members, and commercial activities. As the Shaker community declined in population in the early 20th century, the site was gradually sold to various private owners, including the Darrow School, which still inhabits Mount Lebanon’s Church and Center Families, and the Abode of the Message which inhabits the South Family’s buildings. Mount Lebanon was named a National Historic Landmark in 1965, and was recognized by the World Monuments Fund in both 2004 and 2006 as one of the 100 most significant endangered historic sites in the world. I will say that those four masonry walls, still standing, are jaw dropping. There is an effort underway to restore that structure. We were met in the visitors’ building by a friendly docent who again had great depth of knowledge about the history there. We did not have much time to explore the site because it was already mid afternoon and we had a five hour drive ahead of us to get home. I would very much like to go back there to walk the grounds. It’s important to note that much of what was the village is now occupied by a private school, so this site is not as intact as Hancock appears to be. Nonetheless, this is a very worthwhile destination. I was struck by this sign when you walk in to the visitors’ center/gift shop. “What did the Shakers invent? It turned out that one of the owners makes imaginative beaded jewelry, much of it with nods to different meanings and energies. Whether you believe in New Age concepts or not, her work is lovely. I chose a bracelet with “air” charms on it – a hummingbird, wings, feathers, a butterfly -things related to flight. I think I was drawn to it because, in both my life and my work, I am seeking as much freedom as I can create for myself. It, along with the “Failure is impossible” bracelet from the Susan B. Anthony Birthplace Museum are happy reminders of both an enjoyable weekend away and my desired life direction. I hope you have enjoyed these two posts highlighting our weekend away and hope even more you will visit some of the places I’ve described. If you have traveled to any of these places as well, I’d love to hear your impressions about them in the comments. If you have interest in Shaker life, I would very much encourage you to visit the Sabbathday Lake community in New Gloucester, Maine, just about half an hour south of the Parris House. There is truly inspiration everywhere. I am a planner junkie. In fact, I have a planner, two workbooks, a wall poster calendar, and several calendars around the Parris House to keep me as organized as possible. That’s not to say it’s always 100% effective, but I’m a writing-it-down kind of woman. The particular organizing and planning system I’m using right now is created by an amazing Australian woman named Leonie Dawson. She’s no nonsense and ethereal simultaneously. Not sure how else to describe her but her work and life planner are highly effective, as is she. To take a peek, click HERE. January 23rd: Last day to register for the Intro to Hooking class I’m teaching at SAD44 Adult Ed. It’s going to be fun! We’re making cute 8″ x 8″ Valentine themed mats that can then be finished as pillows or table toppers or wall hangings – your choice. Classes will be Monday, January 30th and Monday, February 13th. FMI, click HERE. January 28th: Beginner Dye Class at the Parris House. This is one of the most fun classes I have here. You learn three different methods of wool dyeing and leave with a full yard of your own hand dyed wool, ready to cut and hook with, or use with any other craft you please. FMI, click HERE. February 4th: Intro to Cold Process Soap Making at the Parris House. You will learn the art of cold process soap making *and* leave with 2 pounds of freshly made soap, a recipe to use at home, a soap mold, and safety equipment. FMI, click HERE. March 11th: Yes, You Are & Yes, You Can, beginner rug pattern design class at the Parris House. Another great class that’s super fun! You will learn genres, design tips and tricks, getting your pattern on the grain, and so much more. You will leave with a completely finished linen pattern of your own design, all ready to hook. FMI, click HERE. April 1st: Soap making again! See earlier description, but for tickets for this date click HERE. April 22nd: 207 Creatives Belfast Hook In, First Church of Belfast, UCC, Belfast, Maine. Many of you already know about this event and are even signed up for it, but for ALL the information, click HERE. We are finalizing some summer dates for my classes at the Sabbathday Lake Shaker Village this year, so follow their page at THIS LINK for updates on my and many other great classes. September 9th & 10th, Sharon Springs Harvest Festival, Sharon Springs, NY. You know you want to go to one of the premier fall festivals on the east coast and meet the Fabulous Beekman Boys, so why not make this the year? I will be there vending again this year and am hoping to persuade some other New England artisans to join me. FMI, click HERE. November 4th, Fifth Annual Paris Hill Hook In, Paris Hill, Maine. You read it here first! Pencil (or better, do it in ink) this in on your calendar and I will have all of the information and registration forms coming by April. In fact, I will have registration forms with me at the 207 Creatives Belfast Hook In, so ask for one there. On the planning table for possible classes to be held at the Parris House are art journaling, ecoprinting/dyeing, a permaculture class, and natural dye techniques, so do stay tuned. As I add more dates, you can always see what’s happening on our Classes & Workshops tab on the website and on our Events section of the Facebook page. Plan to join us for some or all of these events and in the meantime, happy hooking! It's Hot. Make This Amazing Iced Tea using Society of Shakers Fruit Blend. It’s been uncharacteristically hot and humid here in Paris, Maine for the past several days. Today, thanks to a cold front passing through, we have much cooler, drier conditions. I’d enjoy the recipe I’m about to give you any day of the year, but it’s proven especially good when you’re trying to survive a dog day of summer. I spent last weekend mostly at the Sabbathday Lake Shaker Village in New Gloucester, Maine. On Saturday, my husband and I taught a beginner soap making workshop, and then on Sunday I participated in Open Farm Day, demonstrating rug hooking in the historic Shaker barn. After our workshop on Saturday, we stopped in to the Shaker store and picked up the Society of Shakers Fruit Blend Tea. You can purchase it HERE in the on-line Shaker store, but if you are local or anywhere near local, better yet to go visit the community and take advantage of their wonderful farm and garden tours, two beautiful shops, educational programs, and inviting and peaceful atmosphere. Lots of things in the Shaker stores would make amazing holiday gifts, so start your shopping early. The Fruit Blend Tea is unbelievably delicious and refreshing. In the fall, you’ll want their mulling spices, but let’s not get ahead of ourselves. Put three heaping teaspoons of Society of Shakers Fruit Blend Tea in a 1 quart Ball jar. I brew mine loose and then strain it, but you can use a tea ball that will fit through the opening. A wide mouth jar is best for this. Add almost boiling water to the 3 cup marker on the side. Let brew at least 8 – 10 minutes; you want it to be strong. If you need to strain the tea, now is the time to do it, but put it in to another quart sized Ball jar. 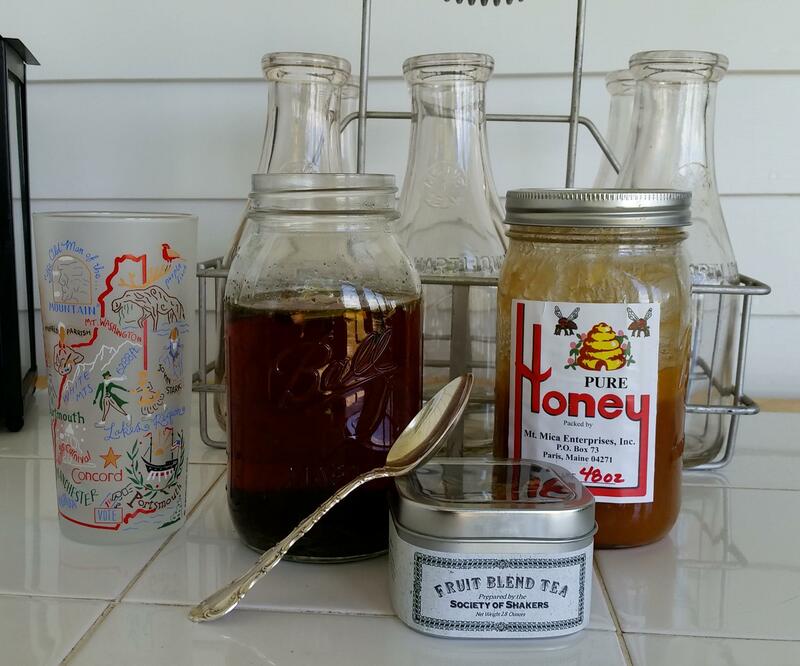 Add a heaping teaspoon of local honey or to taste. I do believe at certain times of year you can purchase Shaker honey as well. I get mine from a self serve stand on Mount Mica Road in Paris, Maine. See the label in the pic! Next year, fingers crossed, we will be offering Parris House Honey from our own hives. Now add ice until the tea level comes to just the bottom of the jar lid threads. When the ice melts it’s ready to drink! Pour it over ice or put it in the fridge to chill. I have been making one of these jars every morning and just about finishing it over the course of the day. You could add lemon or lime to it, but honestly, the flavors in this tea are so perfectly blended I have found that adding fresh citrus takes a bit away from it. Nor does it really need fresh mint as it already has some mint incorporated. I support the Sabbathday Lake Shaker community as a Friend of the Shakers and through teaching and volunteer work at the village. I hope you will consider doing so as well. The Sabbathday Lake community is the home of three living Shakers, Brother Arnold, Sister June, and Sister Frances. There is no other Shaker site in the nation inhabited by Shakers. You may read about them in this Downeast Magazine article, aptly titled, Unshaken. The Shakers are very engaged with the outside world lest anyone think they are cloistered, and yet they are examples of love, faith, hard work, and devotion, qualities we could all aspire to just a little more in this world of ours.